A proposed 90-story mixed-use residential tower by international architect Carlos Ott—in partnership with Crown Architecture, Davis Partnership Architects, and New York City–based developer Greenwich Realty Capital—has the potential to become the tallest tower in Denver. The project is dubbed Six Fifty 17 and would contain 284 high-end condominiums, a hotel, and 22,000 square feet of retail space. The podium style structure would also feature a 13-story parking garage containing 500 stalls and retail spaces along its lower levels. 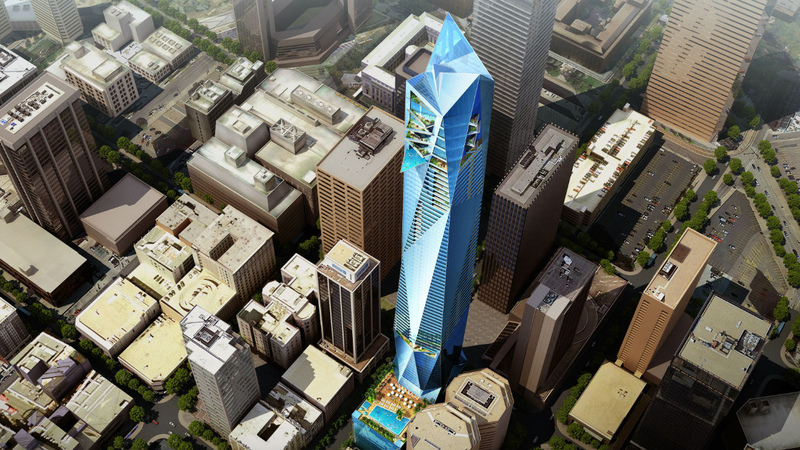 Renderings for the project depict a faceted, blue-glass-clad tower topped by a sculptural crown. The tower’s upper levels feature offset and cantilevered planted terraces while the roof of the podium structure will offer an amenity level for hotel guests. If built as currently planned, the spire would rise 1,000 feet high, dwarfing the city’s current height leader—the Republic Plaza tower, a gridded, 54-story office tower designed by Skidmore, Owings, and Merrill in 1984, which rises 714 feet. Under these metrics, the tower would also become the 19th tallest in the United States overall, according to a recent USA Today report. The project, first reported by The Metropolitan, the student newspaper at Metropolitan State University of Denver, comes amid a flurry of new construction across the Denver area, especially high-rise and affordable housing construction. Even so, it is unclear whether the project is really in the works or not. 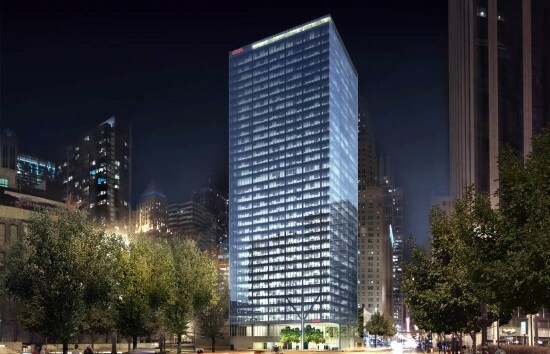 The Denver Post reports that the city’s planning department does not consider the tower “an active project right now,” though the agency is ready to review plans for the proposal once submitted. 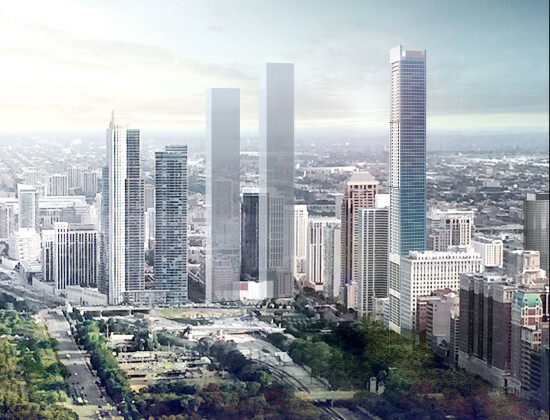 Adding to the confusion, a 42-page document posted to an Issuu site maintained by Crown Architecture shows an 800-foot-tall, 85-story high structure accompanying the same renderings as those showcased on the project website. For now, however, the tower remains an idea. The next few months will tell how real those plans might become. The team behind the project hopes to break ground on the project in 2018. See the project website for more information. The Willis Tower (formerly known as, and still referred to by locals as, the Sears Tower) has been bumped from the Council on Tall Buildings & Urban Habitat’s (CTBUH) top ten tallest buildings in the world list with the completion of the Gensler-designed Shanghai Tower in Shanghai, China. 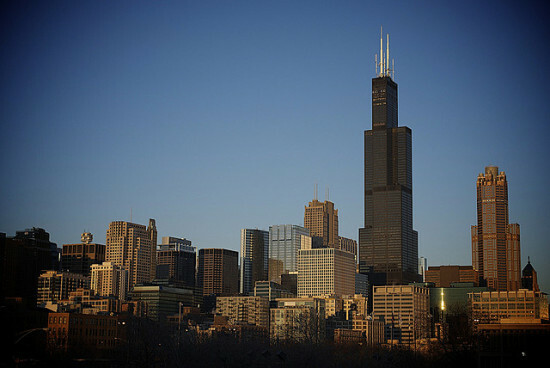 The significance of the Willis Tower’s fall from the top ten is in the fact that Chicago, as the birthplace of the skyscraper typology, has consistently been included in the list of top ten tallest buildings for at least the last 50 years. At 1,450 feet tall, the Willis Tower held the position of tallest in the world for 24 years from 1974–1998, when it was topped by the 1,483-foot-tall Petronas Towers in Kuala Lumpur, Malaysia. The Council on Tall Building and Urban Habitat measures buildings “from the level of the lowest, significant, open-air, pedestrian entrance to the architectural top of the building, including spires, but not including antennae, signage, flagpoles or other functional-technical equipment” Perhaps in a twist of irony, the tallest buildings in the world that have pushed Chicago out of the rankings have often been designed in Chicago or by Chicago-based offices. Though designed in its San Francisco office, the Shanghai Tower is the work of Chicago-based Gensler. The current world’s tallest building, Dubai's 2,717-foot-tall Burj Khalifa, was designed by Chicago-based SOM, also the designers of the Willis Tower. SOM is also responsible for the design of One World Trade Center in New York, which bumped the Willis Tower from its position as tallest building in the United States. Chicago-based Adrian Smith of Adrian Smith + Gordon Gill, former design partner and head of the Burj Khalifa project at SOM, is also responsible for the Jeddah Tower which will take the crown of tallest in the world when it is completed in 2020, rising over Jeddah, Saudi Arabia, at a height of over 3,300 feet. Though Chicago no longer boasts the tallest skyline, the expertise of its architects is in higher demand than ever. According to the CTBUH, Chicago’s Willis Tower, and many other towers in the United States, will hardly break the top 50 tallest buildings in the world within the next 10 years, yet it can counted on that many of the multitudes of Asian towers soon to be crowding the top will be designed in the city where it all began. The two-story Mies Townhouses are some of the more desirable pieces of real estate in Detroit, routinely fetching $150,000-$200,000 a pop for the three-bedroom, one-and-a-half bath units. The twin Lafayette Towers were added to the skyline in 1963. There are also a number of other buildings in the development designed by other architects, though they all follow Mies' lead. Indeed, U.S. Rep. "Charles Diggs, (Judge) Wade McCree, Judge George Crockett and others all lived in Lafayette Park," said Ken Coleman, an author and expert on black history in Detroit. "Even Berry Gordy had a condo there by 1965." 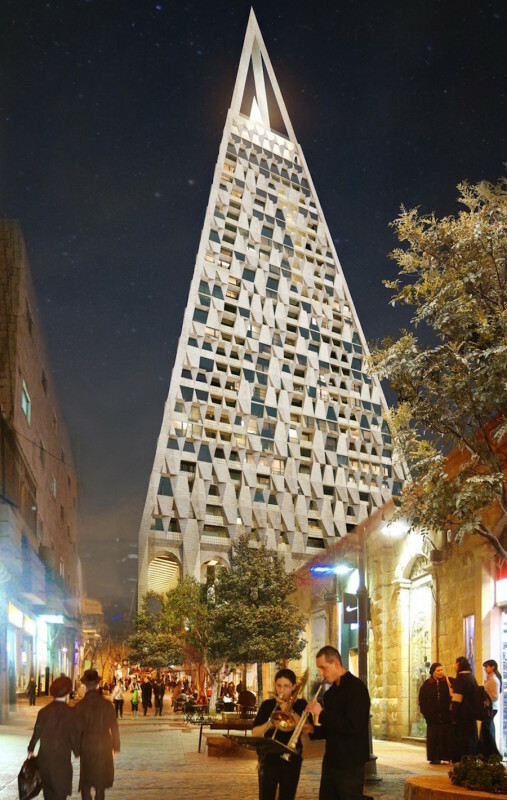 Jerusalem's municipal committee has approved the construction of The Pyramid, a 26 story building by starchitect Daniel Libeskind that will become the city's second tallest building. Libeskind worked alongside Israeli architect Yigal Levi in designing the 344-foot-tall luxury high-rise that is set to break ground by 2019. The structure will be built above the ruins of Israel's century-old Eden Theater and across from the famed Mahane Yehuda Market, also known as The Shuk. The Pyramid's facade, with its half-stone, half-glass tessellated panel and embedded Star of David, is placed atop colossal colonnades that connect shops located around a public plaza. The tapering characteristic of the Pyramid gravitate towards the sharp, open tip that will serve as both a roof-top observatory and a restaurant. Besides retail, the project features 200 apartments and a boutique hotel. "The Pyramid mediates between ancient traditions and myths, while providing a 21st century reinterpretation of that great form,” Libeskind said in a statement on his website. "The design complements the context and gives the neighborhood a vibrant public space in the heart of the ancient city." The project was proposed by Libeskind and Levi back in 2011 with a different design. The original included a curved, wave-shaped tower with Jerusalem-style gates. "We want to bring to the city center the revolution that Mamilla spurred in its area," Levi told Hareetz in a 2011 article, referring to the luxurious mall on the Alrov Mamilla Avenue strip. "There are a lot of new projects in the city center, but they don't create a meeting place where people can linger and meet." Jerusalem is currently in the midst of a transformation into an even more bustling business and tourism region with at least eight other high-rise projects proposed since 2011, spurring some architects, politicians, and urban planners to caution that so much development could damage the city's known historic heritage. Pyramidal shapes have been growing in popularity for high-rise design in recent years, with Bjarke Ingels' under construction Via "courtscraper" under construction in Manhattan and Herzog & de Meuron's pyramid tower in Paris moving forward. Architect Clarence Hatzfield's 1921 temple was built in a very different Englewood than today's. At the time, the South Side neighborhood was home to the second busiest commercial corridor in the city after downtown. Vacant for decades, the classically detailed building has an outstanding demolition permit. “It's a prominent and vibrant structure that really deserves a reuse plan,” said Preservation Chicago's Ward Miller. The building made their list in 2004, as well as similar watch lists from sister organization Landmarks Illinois in 2003–2004 and 2009–2010. “We really think this is the last call for the Masonic temple,” Miller said. 2. Main Building, 3300 S. Federal St. This vacant, red brick structure is visible from the Dan Ryan Expressway, its 1890s splendor a unique presence on the mostly modernist campus of the Illinois Institute of Technology. 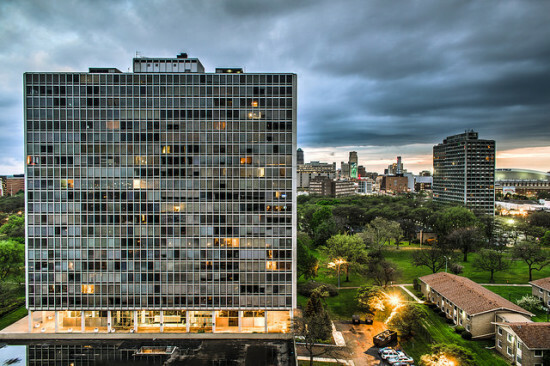 IIT, which owns the Chicago landmark, has not been an absent landlord, however, renovating its interior over the years and recently putting out a request for proposals on the Romanesque revival structure. Nonetheless structural issues threaten this Patten & Fisher building that predates the 1893 Columbian Exposition. 3. A. Finkl & Sons Company Buildings, Kingsbury & The North Branch of the Chicago River Comprising 28 acres of land along the north branch of the Chicago River, this defunct industrial complex has an uncertain future. Once a symbol of Chicago's industrial might, this former manufacturing corridor churned out leather and forged steel. Now it's flanked with wealthy residential communities, its original industrial tenants gone for greener pastures. In 2014 Finkl & Sons moved their operations to Chicago's southeast side, provoking questions about the site's future that Robin Amer explored in detail for the magazine Rust Belt. 4. 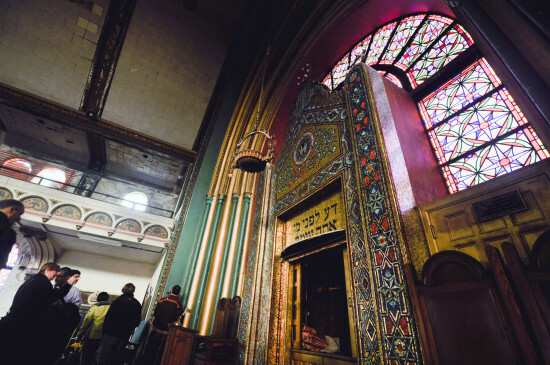 Agudas Achim North Shore Synagogue, 5029 N. Kenmore Ave. An historic synagogue on a residential block in Uptown, Agudas Achim boasts an unusual blend of architectural styles, mixing Spanish and Romanesque revival flourishes with Art Deco detailing. Brilliant stained glass windows and strange details in the 1922 building's 2,200-seat sanctuary shine through the building's dilapidation, which is substantial after years of vacancy. 5. Clarendon Park Community Center, 4501 N. Clarendon St. The Clarendon Park Community Center and Field House, originally called the Clarendon Municipal Bathing Beach, is now a community center and field house. When it was built in 1916, its Mediterranean-revival, resort-style design was meant to remind Chicagoans of Lake Michigan's splendor. That meant it was also supposed to erase memories of cholera outbreaks and squalor along the shores of a rapidly industrializing, young city. Changes to the structure, particularly in 1972, led to water infiltration and roof issues, as well as alterations to the building's historic towers and colonnades. It sits in a tax-increment financing district adjacent to another threatened building, the historic Cuneo Hospital. Miller suggested the two could be saved and redeveloped together. 6. Pioneer Arcade & New Apollo Theater, 1535-1541 N. Pulaski Rd. Another former commercial corridor that has fallen on tough times, the area around North & Pulaski in West Humboldt Park retains several important works of 1920s architecture that include some of the city's best Spanish Colonial Revival design. Restoring the commercial structures to their former glory may prove challenging, but Preservation Chicago hopes previous attempts to redevelop individual buildings could coalesce into a larger restoration project using national and local historic rehabilitation tax incentives. Not a building but an essential part of the city's built environment, Chicago's de facto public art gallery of neon signs overhanging public streets is under threat. Donald Trump's sign notwithstanding, many of the commercial advertisements on Chicago streets are beloved local icons. Many are also code violations in waiting, so the challenge is to find and fix up historic signs while scrapping rusted-out, replaceable ones. DNAinfo Chicago collected a few of their readers' favorite neon signs, which you can see here. Visit Curbed Chicago for a map of city showing all seven buildings. More information on the list can be found on Preservation Chicago's website. 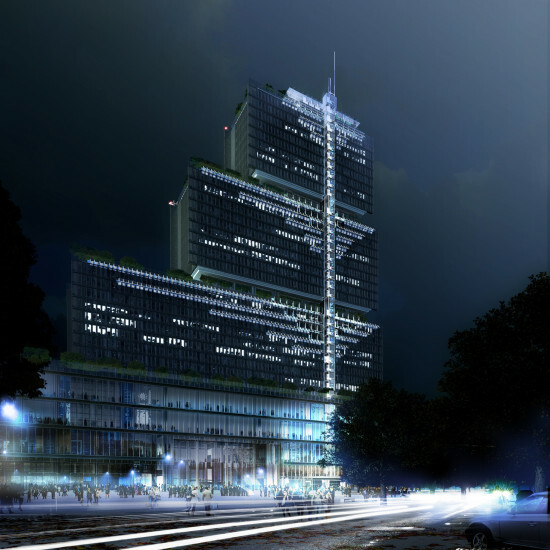 Renzo Piano has unveiled renderings for the new Palais de Justice, positioned on the northern edge of central Paris in the urban expansion area of Clichy-Batignolles, which will provide space for and unite numerous judicial services presently scattered throughout the city. The law courts complex appears as a slender, translucent, 525-foot-tall tower comprised of four stacked rectangular masses diminishing in size as they ascend. The structure includes extensive fenestration to blend the division of the interior and exterior, in addition to two exterior glass elevators offering expansive views of the city. Three atria at the 64,600 square foot ground level piazza direct views into the towers overhead that encompass 30 floors grouped into three levels, each containing 10 floors. The structure consists of 90 courtrooms, offices, and meeting rooms for the magistrates, public prosecutor, and presiding judges. The floor plans within the three sections decrease in scale, forming a tiered system with space for terraces, which incorporate roof gardens landscaped with trees. The terraces accommodate solar panels and a rainwater collection system, and the building is on track to set a new standard for energy efficiency in tall buildings. Designed for efficiency and simplicity, the thin proportions of the courthouse are systematically organized so as to guarantee plentiful daylight throughout, and even extending to the tower’s center. The site is situated at a major crossroads between the administrative areas of the city and its suburbs, and is well linked by public transportation, including the northern expanse of the exceedingly successful, recently completed tramway system. The Palais de Justice is expected to open by 2017. Rafael Viñoly Architects has unveiled plans for a new 70-story residential tower located just a small block from the World Trade Center at 22 Thames Street. The developers are looking to replace the 10-story, former American Stock Exchange building with an 870-foot skyscraper. 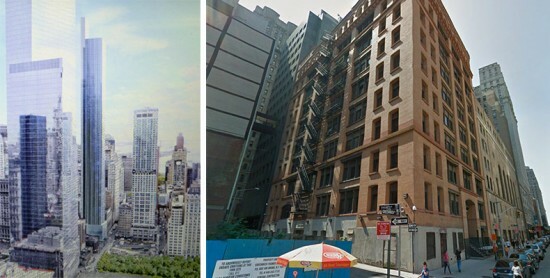 Fisher Brothers, who bought the site for $87.5 million in 2012, asked Rafael Viñoly to design the building and initial plans were presented to members of Community Board 1 last week, where Curbed and the Tribeca Tribune snapped photos of Viñoly's rendering. The glass building would include space for 450 apartments and commercial use on the ground floor. 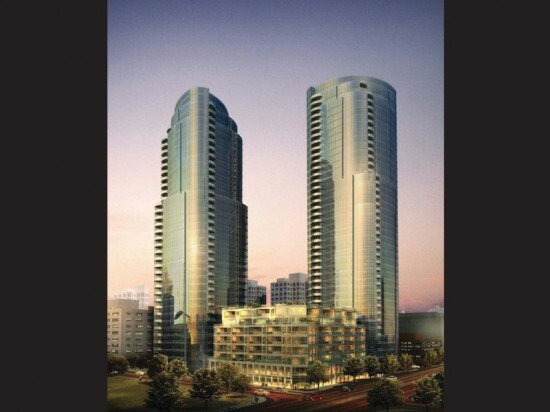 Under the existing zoning, the developers have the right to construct an 85-story tower. However, the company unexpectedly has decided to build a shorter, wider tower better suited for the area. The layout would create space for more spacious apartments and not block the neighboring 1,776-foot One World Trade Center. The skyscraper would act as a transition between the soaring World Trade Center and the low-rise masonry buildings on Greenwich Street. The requested zoning variance would reduce the required setback of the building from 20 feet to 10 or 13 feet, allowing for a wider building. While the number of apartments in the building may change, at least 20 percent will be set aside for affordable housing. The project will integrate environmentally-friendly design and energy efficiency. 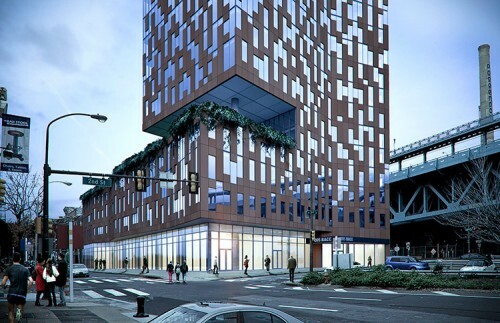 In the fall, Fisher Brothers will supply a more comprehensive presentation to CB1’s Financial District Committee when it seeks advisory approval for the zoning variance. The city will make the ultimate decision regarding the zoning amendment. A Fisher Brothers representative has revealed a completion goal of September 2017, if all goes as planned. In 2005, San Francisco officials rezoned Rincon Hill, a neighborhood close to the Financial District, to allow for high-density housing. Since then, residential developments have popped up, including The Infinity, One Rincon Hill, and the under construction 45 Lansing Street, in an area that was once a maritime and industrial hub. The newest, Tishman Speyer and China Vanke's LUMINA, at 201 Folsom Street, broke ground this Wednesday. The Arquitectonica-designed development will add 655 condos to the Rincon Hill neighborhood, with views of the city and bay. The residence—two towers (the tallest at 42 stories) and two mid-rise buildings arranged along a courtyard—will have luxury amenities like floor-to-celing windows, a full service sky terrace, and a three-story clubhouse with a pool. Expected completion for the project is spring 2015.